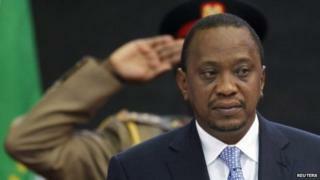 Prosecutors at the International Criminal Court have asked for the case against Kenyan President Uhuru Kenyatta to be adjourned indefinitely. ICC chief prosecutor Fatou Bensouda said she still did not have enough evidence to proceed with the trial, which was due to resume next month. The trial has already been delayed several times, with key witnesses pulling out. Mr Kenyatta denies organising ethnic massacres after the 2007 election. He is charged with crimes against humanity after some 1,200 people were killed and 600,000 driven from their homes. Africa's leaders have lobbied for the case to be dropped, accusing the ICC of only investigating alleged atrocities in Africa. Ms Bensouda, a Gambian national, denies this, arguing that she is standing up for the African victims. She accused Mr Kenyatta's government of failing to fulfil its obligations to the court to supply information she has requested. She said the case should be delayed "until such time the government of Kenya executes the [prosecution's] revised request in full. Mr Kenyatta's lawyers have repeatedly said the whole case should be dropped because of a lack of evidence. They, and the victims' legal representatives, now have until 10 September to respond to the adjournment request. Mr Kenyatta was elected in 2013, despite facing the charges. Analysts said he turned the prosecution to his advantage, portraying it as foreign intervention in Kenya's domestic affairs. Mr Kenyatta is accused of organising an ethnic Kikuyu gang, the Mungiki sect, to attack rival groups - charges he denies. His Vice-President, William Ruto, faces similar charges, although he was on Mr Odinga's side during the violence.